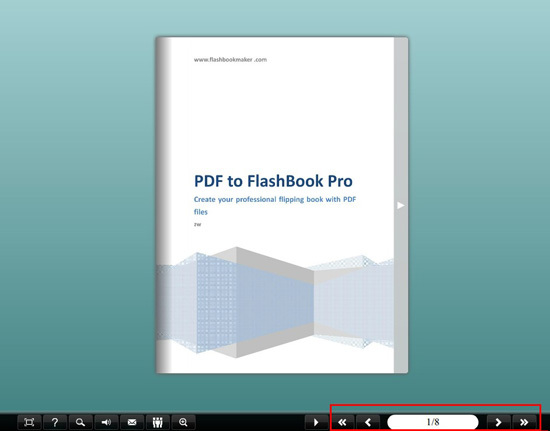 Q: Instant control pages of flash flip catalog? When you’re presenting your product with a flipping catalog, you have to flip it over and over again. It would be a time wasting if you flip page by page; you need a quick way to flip to your target page. Use the toolbar wisely could save your time and work efficiently. Look at the right side of your catalog’s toolbar, there’s a page control area. As many websites do, our flip page software have convenient page controller. In a general way, by clicking “previous page” or “next page” you can flip to the front or next page, but if you want to flip to a specific page, you don’t need to click them again and again, just enter the page number in the blank and push Enter, catalog will jump to that page automatically.